It was ordered that the allegations in the Bill be investigated. A committee was formed, led by one Mr Wilkinson and comprising of Members from the House who served for the counties of Yorkshire, Lincolnshire and Nottinghamshire. Mr Wilkinson reported back to the Commons in March, declaring the Committee had found the allegations to be true, but had amended the Bill in several areas. These amendments are not listed. The Clerk of the Commons placed the Bill, with amendments, to the Commons who gave their assent on 4th April. The Bill was then taken to the House of Lords by Mr Wilkinson. The Lords passed the Bill, after two readings, without further amendment on 4th May. It was then sent to the King, George II, who gave it his assent on 15th May. 1. At the time of the lease being made with Richard Levit in 1740 Stephen Croft had no son. The two other Crofts mentioned are his youngest brothers. Christopher was born in 1720. John, born 1732, was in Stephen's wardship as their father had died a little over a year after John's birth. It was John who is well known for his involvement with the wine trade, following his uncle, also John, into the business. It is very possible that he travelled with Stephen to Portugal in the early 1740s. He was a well known figure in York, where he lived on his retirement, and he wrote several books. Two were on the wines of Portugal and another was about Laurence Sterne. 2. The deeds of the older houses in Stillington originate from this date. 3. 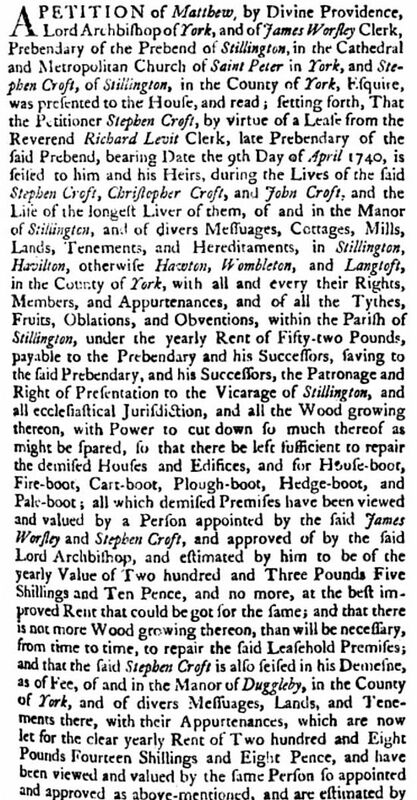 Duggleby came into the hands of the Croft family through the wife of Thomas Croft, (c1618 - c1648) Olive daughter of John Dyneley of Bramhope. Olive was an heiress, as was her mother Faith, nee Ackroyd, who brought Duggleby as part of her marriage settlement. 4. Stephen Croft leased back part of Duggleby from James Worsley. The other part was leased to the Sykes family of Sledmere House.